what is an accessible home or disability house? A disability house or an accessible home allows people with disabilities to live independently. In a house built specifically for independent living. Or an existing home modified to enable independent living. An Accessible Home or disability house could be a multi-generational home where several generations can live comfortably in one house. Or where one person can live in the same house for their lifetime. Whereby changing a home to suit a person during their lifetime, you adapt the house as a person ages. They can live their entire life in the same household. Where changes made to their home accommodate their age-related disabilities and changing needs. How can I make my house wheelchair friendly? 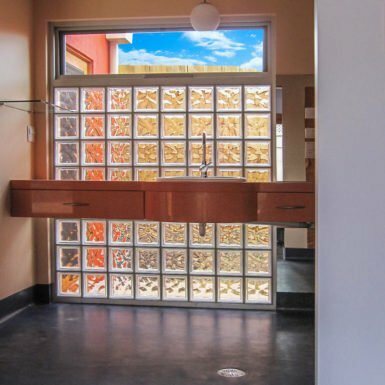 So you want to make your home a disability house and wheelchair-friendly. A sure way to find out how to do this is to try and get around your home in a wheelchair. This way you notice all the problems faced by wheelchair occupants. You might not see how difficult it is for a person who uses a wheelchair if you are walking through your home. And how even a low step becomes impossible for a person in a wheelchair to access. How about looking through a peephole at the front door when you are in a wheelchair. 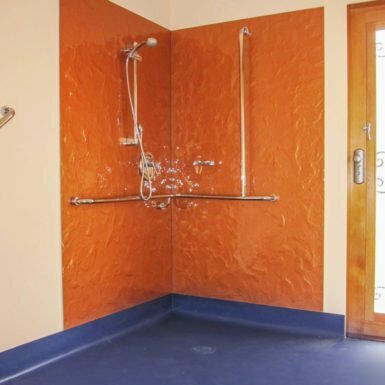 You can start to see that there needs to be a whole rethink about the design of a home what it takes to make a home a wheelchair friendly disability house. So let’s start with the basics. You want access to your home to be easy. So you can get into your home with ease, and it is comfortable to get around. Also, if you need to, you can change your home according to your needs. Does that sound about right? So starting with the entrance of your home and making sure that your entry is accessible for someone with disabilities. Also, you want to make sure that the person with disabilities can use the main living areas of your home. A disability home has doors that are wide enough for a person in a wheelchair to pass through. And a person with disabilities can open and close doors so that the person with disabilities can get around the dwelling without difficulty. Light switches and electrical outlets are all accessible for someone in a wheelchair. And you position light switches and electrical outlets and thermostats within reach. Well, life does not begin at the front door. 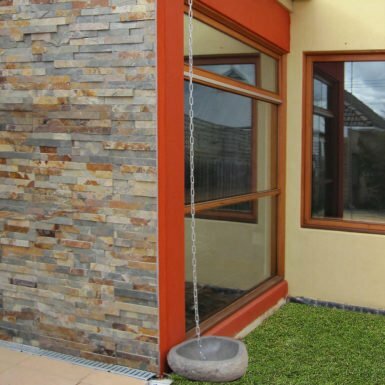 So you may as well extend easy access to the front boundary of your home. How do you get from your front door to your front fence easily and in a wheelchair? Ideally, you want a generous width to the path. A pathway that is at least 1m wide or wider. You would have no steps, and the surface of this path would be firm and slip resistant. You don’t’ want a steep side slope on this path of travel. And the incline up or down the pathway should be no more than 1 in 14. The same applies to ramps. Ramp widths should be 1m wide with no more than a 1 in 14 gradients and a handrail on both sides. Unless you are in a wheelchair, it may not be obvious how difficult it is to get from your front door to the footpath. But if you allow for these things, it will make it a lot easier. For a wheelchair to pass easily through a doorway, the smallest doorway width is 820mm. The wider the door opening, the better. 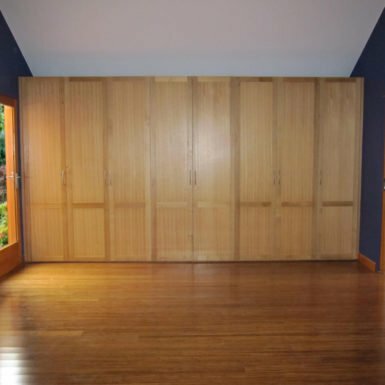 If possible, you can have 1m wide door openings. The same applies to hallways. For a wheelchair friendly disability house, you want wide hallways. Wide hallways that are at least 1.2m wide. Allowing enough space for a wheelchair to circulate throughout the home with ease. Accessible toilets have specific requirements. From the width of the room to the location of the toilet-pan from the wall to the position of the hand basin and grab rails. With the door opening outwards and a door that can be removable from its hinges. Reinforcing bathroom walls allow for the later installation of grab bars. So that when the need arises the installation of bathroom grabrails isn’t an issue. The vanity in a wheelchair friendly disability house doesn’t have cupboards underneath. So that someone in a wheelchair can use the bathroom vanity without difficulty. What do you need to do to your kitchen to make it wheelchair friendly? How do you have a wheelchair up next to a kitchen bench if there are cupboards underneath? You may need to have open spaces under the benchtops so the wheelchair can easily fit close to the benchtop. So that the person in the wheelchair can independently work on the benchtop. Furthermore, the height of the benchtop is at the right height for the person in the household. What height would this be? It depends on the height of the wheelchair. How do you access your oven? You might choose a side opening wall mounted oven with a pullout board beneath. Or pull out workbenches at different heights. You might have no cupboards under the sink or cooktop so that a wheelchair can get up close to operate. You utilize pull out drawers for storage rather than deep shelves and cabinets. So if you want your home to be a disability house and wheelchair friendly, it is not about putting in a ramp. It carries the whole way through the house from locating light switches to the bench and vanity heights to the types of floor surfaces. what is the minimum width of a door for wheelchair accessibility? What is the minimum width of a door for wheelchair accessibility? The answer is the more significant the door opening, the better. Wide door openings are essential for wheelchair accessibility. You want to have at least a clear door opening of 820mm. Adaptable housing is a house that changes to meet your needs. You could find yourself in a situation where you have lost a limb. Or have suffered blindness. Or you may be suffering from an illness or disease. You could have suffered horrendous burns, and this has limited your movement. Or you could have severe respiratory injuries. So, adaptable housing allows you to stay and live in your home. With changes made to your home so that you can still operate and manage within your home. what is a livable house? A livable house is a home designed to allow you to stay in your home no matter what. If you break a leg, and you need to use a wheelchair. A livable house design means that you can go home and use a wheelchair in your home. Your door openings are wide enough. You can reach your light switches and open your doors. A home designed as a livable house means that if you do need to use a wheelchair you can. Firstly, a person who uses a wheelchair can travel from the front boundary of your home to your front door. Secondly, you can get into your house, and a wheelchair can pass through the front door opening. Thirdly, they can then move around your home without difficulty. You can enter a livable home with ease, and it is easy to navigate in and around. A livable home means that any changes to your home are at the least expense. And they are easy to do to suit your changing needs. who can benefit from a livable house? So, as your home situation changes your house can vary as well whether you are a family with young children. You may need to manoeuve prams and strollers around your home. And remove trip hazards for the safety of your toddlers. To people who may have sustained a temporary injury. That limits their mobility. For example, if you suffered injuries from a car accident. And because of these injuries, you find that you need to get around your house in a wheelchair. How would you do this in your current home or living situation? Well in a livable house you could go home and manage to keep on living in your livable house. Or you as a baby boomer. At this time in your life, you may want to move or renovate your home so that you prepare and have better accommodation for your future needs. The design of a livable house allows people with disability and their families to live in their home. It provides them with a better choice of housing. It is enabling them to be able to visit their friends and relatives in their livable dwellings. Colour and delight in a disability House. Designed to be Accessible, Liveable and Sustainable. Who said that a disability house had to look like an institution? Our Clients, Mark and Dorothy, loved colours. In particular, they loved the intense shades of orange and blue. So when it came time to design a home for them, these colours was a strong theme in their new home. Mark had a muscular dystrophy disease. So to get around Mark used an electric wheelchair. The result is that Mark and Dorothy’s house is a colourful, delightful disability home. It was also critical for both Mark and Dorothy to have a low-maintenance home. And a house that allowed them to live sustainably. 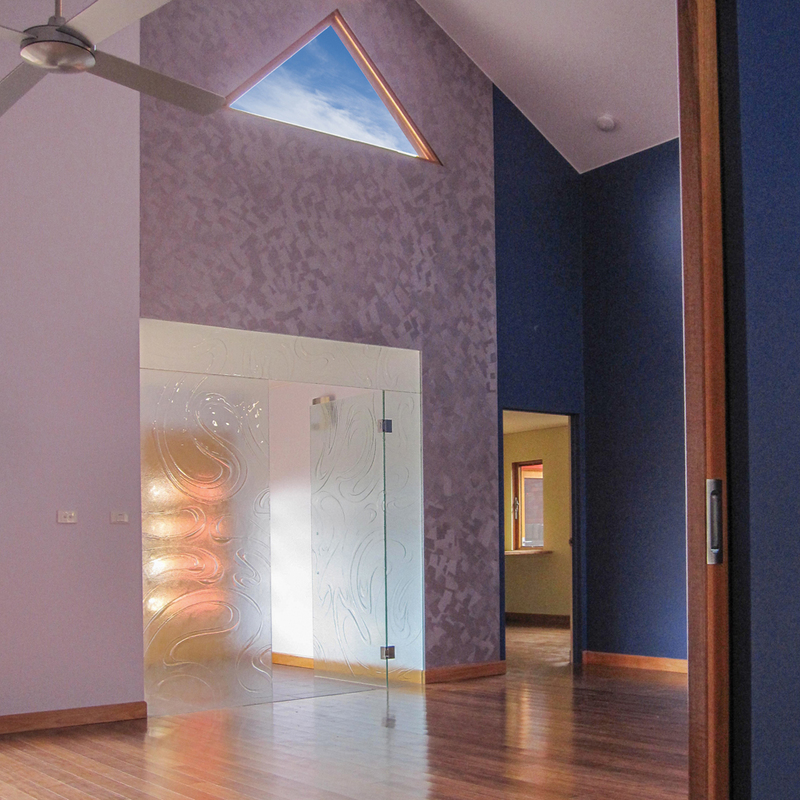 The Essendon disability house is a bright, light and colourful home with sky views. Enabling our young client’s full use of their home. Spending less of their valuable time cleaning and tidying their new low-maintenance house. And allowing them to spend more time on the essential things in life. A passing wheelchair easily damages plasterboard walls. The installation of a more robust wall lining helps prevent damage to the interior walls. This wall lining also had the benefit of providing acoustic wall linings so that the home is a quiet home. Despite the Essendon disability house having a lack of furnishings and drapes. 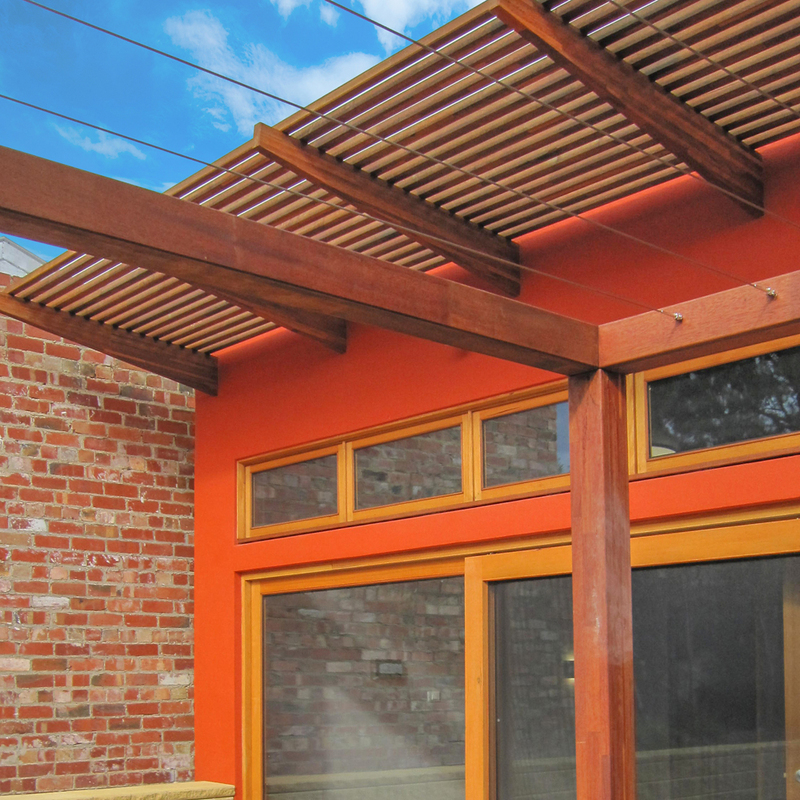 The design of the Essendon disability house makes it fully accessible. And a wheelchair friendly home. Passive solar design features make it a comfortable home. Moreover, the energy efficiency house design means low energy bills for our Clients. Besides that air conditioning is not required during summer. And as well as only requiring a small amount of heating during winter to make the home comfortable and cozy. The low maintenance house design meant that Dorothy and Mark could make good use of their time. On the essential more enjoyable things in life. Without having to spend all their time cleaning their home. To make their home look presentable. They could enjoy their home and have it look neat and tidy without a lot of effort. The design of the bathrooms allowed for full use of a wheelchair. They have open stepless showers without shower screens. Toughened glass installed on the walls forms the shower surround. The beautiful patterned coloured glass is easy to keep clean. High Windows provided sky views. 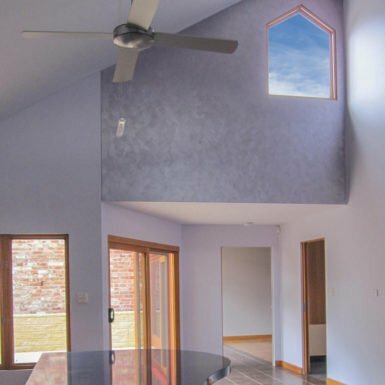 Opening these windows lets the rising hot air out of the home. Placing windows high on walls provided proper ventilation and a safe and secure way to exhaust hot air at night. The north facing window wall of the master bedroom offers views to the courtyard. And by having a north facing window wall this also meant the master bedroom stays warm all year round. The clients wanted sustainable bamboo flooring in their home. To make the most of the winter sun, a tiled floor next to the north facing windows provides thermal mass. Thermal mass helps maintain constant and comfortable indoor air temperatures. The Essendon disability house is in an inner-city suburb of Melbourne, Victoria. Melbourne has a temperate climate. Brick walls and fences on the boundaries protects the house. Shielding the house from cold winter winds and preventing heat loss. Positioned on the south boundary, this opens up the use of the north side of the house for winter sun. The design of the glazed north facing window wall to the master bedroom is precisely for this purpose. So that this room, in particular, receives the much-desired winter warmth from the sun. 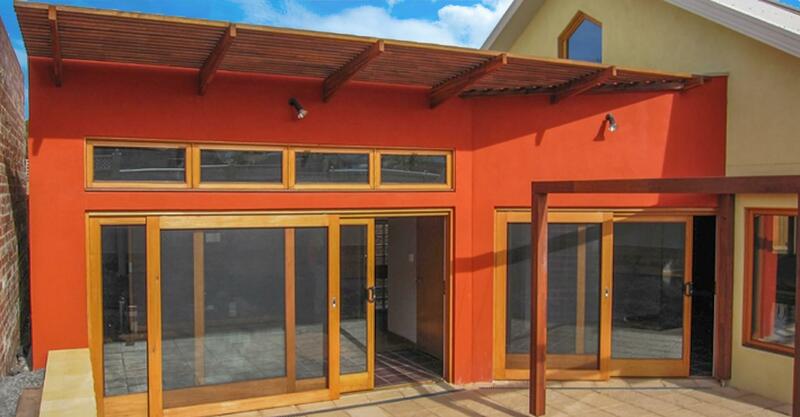 The Essendon disability house is a sustainable building. There are many green design features in the home, including low energy air transfer ducts and reversible ceiling fans. Air transfer ducts in the roof space move warmed air from one room to another. Say from a living room to a bedroom before you retire for the night. Reversible ceiling fans mean that you can change the direction of the fan blades. Ceiling fans use little electricity. And reversing the ceiling fans for the season means you control the air flow. So you can blow the air down to help stay cool in summer. As a breeze is more comfortable than still air in a hot room as it helps with evaporation. And the ceiling fans in reverse can draw air up and recirculate the warmed air, which you can use in winter to move the heated air down to people level. Designed for daylight means that the house is bright and light and well lit during the day without the use of electric lights. A solar pergola in the solar courtyard keeps the house cool in summer. Also, a sun-shading screen shades the master bedroom window wall. Preventing the master bedroom from overheating in summer. The thermal mass in the floor slab acts as a heat sink absorbing the heat from the sun. 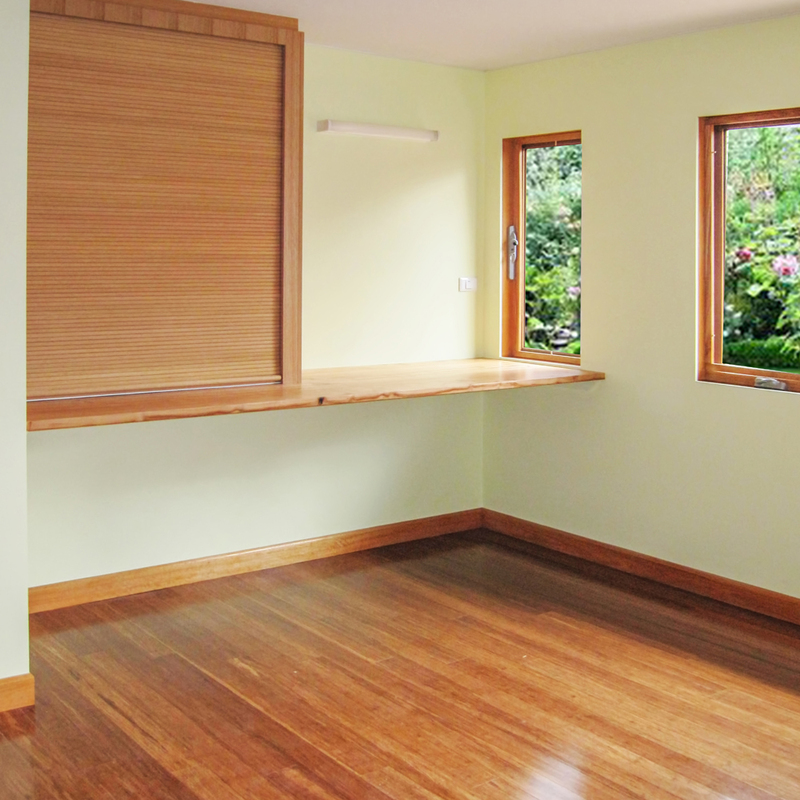 Bamboo flooring will insulate the floor slab from absorbing the winter sun. A compromise resulted in using tiled flooring next to the north windows. Meeting the Client’s desires for bamboo flooring and the benefits of thermal mass. So flooring next to the north windows is dark coloured floor tiles. And the rest of the house is bamboo flooring. Allowing the slab to absorb the warmth from the winter sun rays. And our Clients have the bamboo floors that they loved. An In-Ground Rainwater Tank provides water for toilet flushing. Easy to use touch sensors on the toilet make it a functional toilet in this household. An on-demand recirculating hot water ring installed in the ceiling space saves water. A pump moves cold water in hot water pipes to the water storage tank. So, resulting in hot water when you want it without wasting cold water until it heats up. These features and more make the Essendon disability house a sustainable home. The design of the house provides a sense of space and volume. Flexibility in the planning of the disability house means that spaces can be open up and closed down. In doing so, you can increase the air volume in the disability house in summer. And conversely, in winter, you can reduce the size of the room. With a reduction in the amount of air required to warm the indoor air in winter and to stay comfortable. The Essendon disability house is a warm, open and welcoming home. It is an accessible wheelchair friendly home. The kitchen benchtop allows for a group of people who are in wheelchairs to gather around. BP Architects are Award winning architects. They are expert and experienced in designing eco-friendly homes and disability houses.